Four years ago, my daughter, Sierra Gladfelter, brought her Schuylkill County Student Conservation Club on an educational field trip to Pennsylvania‘s elk range. They went to assist elk biologist John DeBerti with collaring newborn calves for his ongoing research. John would often embrace groups and individuals who wanted to assist in this exciting wildlife encounter. John recently passed away after a long fight with cancer and this story is a tribute to his far-reaching and wonderful contribution. We waded through an ocean of hay-scented ferns, a parallel line combing the wet meadow. High-stepping over stumps, blackberry brambles snag at our sopping wet jeans. Glancing down the line of evenly spaced people, we caught one another’s eye. Where is it? All of a sudden someone lunged, and dropped to the ground, motioning us over. We trotted to their side, craning our necks around one another to see the elk calf bedded down in the soft green furls. Its brown fur was strewn with creamy spots, like dancing chips of sunlight. Eyes white and glassy as marbles bulged out of their sockets and the calf’s nostrils flared in and out. All else was still as it remained curled like a fetus, giving up to certain doom. Long awaited, the club of high school students from Schuylkill County spent two years raising money for the trip through fund raisers and grant money for cleaning up illegal dumps in their county. And they couldn’t be happier to be there! John welcomed our help in collecting data he needs for his research. One member, Bri Rudnsky, volunteered to tag the calf’s ear, as she has had experience tagging 4-H rabbits and goats in the past. Even so, no one could help but wince as the calf strained its neck and bawled in a shrill yelp. It’s over fast however, and now the animal can be identified for the rest of its life. The biologist fished around in the loose skin on its neck for a vein and drew blood. This sample was sent to a lab for a regular chem screening and total blood count. With all the data collected, we gathered up the gear and rose to our feet. As we backed away, the calf attempted to run. Her long, stilt-like legs wobbled. Threatening to collapse as her tail sank unsteadily towards the ground. She disappeared into the rhododendron and the conservation club turned back to the van. On to the next calf! The idea to create a student conservation club in Schuylkill County was sparked Sierra’s sophomore year of homeschooling when she participated in the 2005 Schuylkill River Outreach Team, a weeklong youth summer program through the Conservation District. The students lived out of a van for a week traveling the county doing hands-on fieldwork and discussing critical environmental issues pertaining to the Schuylkill River Watershed. With the help of an advisor at the Conservation District, Sierra was inspired to found the Schuylkill County Student Conservation Club that she coordinated for the last two years she was homeschooling in high school. Her club gathered monthly to do projects that would improve the future of our natural lands, water, ecosystems, and communities. Over twenty projects were conducted in that two-year span, building habitat improvement shelters for wildlife, banding saw-whet owls, stocking fish, conducting river clean ups, planting seedlings, and doing erosion control. The three massive clean-ups of illegal dumps helped them raise enough grant money to fund their trip to the elk range to work with DeBerti. We followed DeBerti and his crew of officers down the back roads of the game lands. The caravan of vehicles lurched down rutted roads in, fishtailed sideways into pond-sized puddles. Pulling over into a ditch, we hopped out. Using radio telemetry, the biologist adjusted the knobs on the radio and detected a distant beep through the hiss of static. First we had to locate a collared female cow and then send one of the biologist’s experienced crew into the bush to take a look at her. If she showed telltale signs of having recently dropped a calf (collapsed stomach, hesitancy to run, etc.) we would move in as a large search party to hunt for the dropped calf. Cows bed down usually no more than 300 feet from the calf, so we knew it wouldn’t be far. As the officer disappeared into the bushes, John related the legacy of the PA elk to the student conservation club. When finished, the officer emerged from the shrubs. “It looks like she’s dropped a calf,” he related. WE became excited and threaded out into a line with several feet between each person. Walking abreast, we traversed the hillside, bushwhacking through dense thickets of wet autumn olive. John had told us if we see a calf lying down to back off and calmly pass the message down the line. The club formed a ring around the calf. It huddled like a fetus; only the calf’s eyes, bulging wide and rimmed in a band of white, bespoke of fear. Not once did it flinch as the biologist slipped through our ranks and sunk to the ground. He placed his hands on its furry side and we passed him a collar. We went on to catch a total of four calves by mid-afternoon. The club members wanted to continue to search for they were only one calf away from tying with John’s all-time record of calves caught in one day, but we ran out of collars first. After an exciting day, we headed back to our camp along the river to start dinner. Over glowing coals, we heated elk chili in a cast iron caldron. No one tasted chili so good. That evening, we went out to spot elk. We nearly ran over two massive bulls who were bedded down in a meadow. They blinked at us, only their ears and velvet antlers floating above the bobbing heads of grass. Captured by their trust, we moved closer until they rose and turned their majestic heads, watching us over their blonde rumps, then disappearing into the fog and forest. The next morning we loaded up our mud-caked van, reluctant to leave the elk range. It had been an adventure the Schuylkill County Student Conservation Club never forgot. As the coordinator, Sierra often struggled with the feeling that there was a lack of enthusiasm when it came to protecting and conserving wild lands and creature sin our county and state, especially among youth. Yet a trip to the Pennsylvania elk herd gave her hope not only for the future of her small club of teenagers in Schuylkill County but also for youth all over the country. Slowly, they instilled a greater appreciation for the natural world. These students physically drug tires from illegal dumps in their backyards that perhaps their very parents and grandparents helped create. They went home and asked their parents to make a trip to the local recycling plant instead next time they needed to be rid of garbage. It is teenagers like these, who participated in scientific research and directly observed how the birds and mammals are tied in an intricate web, who will grow up to respect wild lands and wild animals. Sierra’s best friend, Bri Rudinsky, went on to major in wildlife studies and graduated from at Unity College in Maine and is working at Rachael Carson Wildlife Refuge. Sierra shifted her sights from wildlife biology and decided to study how the entire system of wild animals, humans, water and the land all fit together. She majored in anthropology at Temple University Honors and went on to found an Outdoor Club at Temple with 300 members strong and continued to do conservation work in the city of Philadelphia. Sierra plans to go to graduate school for Geography and work in conflict resolution with the national park/forest service. She was a two-time recipient of the Udall Scholarship for her conservation and environmental work. 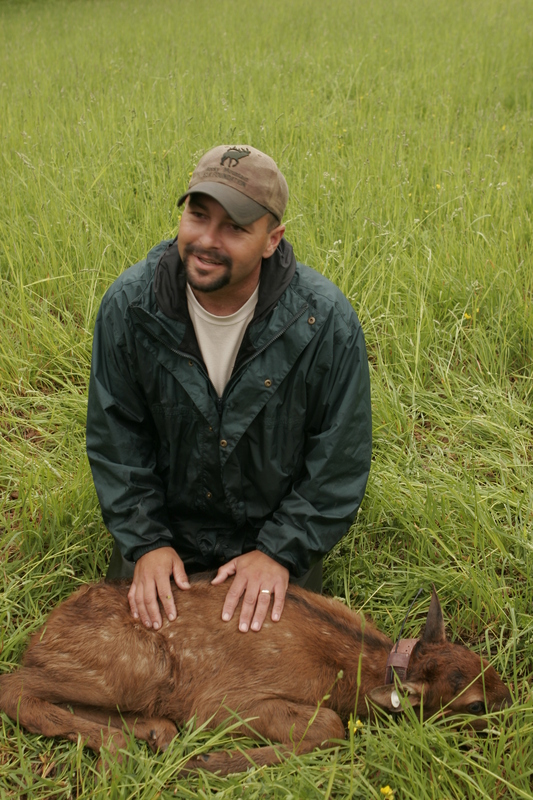 It is easy to say that calf catching in Pennsylvania’s elk range with John DeBerti impacted these students’ lives and helped influence the kind of work they would dedicate their lives to in, hopes of making a positive difference in our world. We all need mentors, heroes, people to look up to, who extend a hand and are unselfish with their time, their passion. To think that this experience was only one in a long list of exchanges that John DeBerti enjoyed in his ten years of working in the elk range. The countless numbers of people (let alone wild creatures) who have felt John’s positive influence rippling out is staggering. We will all miss his presence but we have all been positively and irreversible changed for the better because of him. There is no substitute for kids doing “real work: to give a sense of meaning and purpose…. a tenet of home schooling. And a great benefit of this is finding role models and mentors along the way.